Daschuk’s examination of the ecological, economic, and political factors shaping the history of the Canadian plains—and its Aboriginal inhabitants—from the early 1700s to the eve of the twentieth century is divided into two sections. The first, covering up to Canada’s acquisition of Rupert’s Land in 1870, outlines how the spread of smallpox and other diseases through fur trade networks was devastating for some but presented economic and territorial opportunities for others. 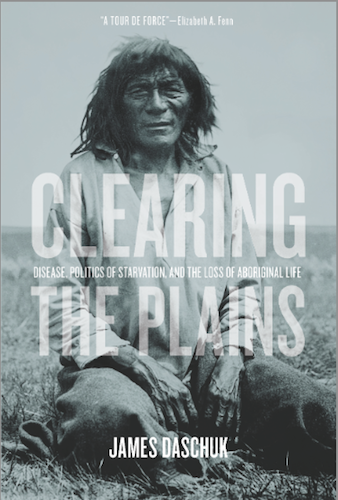 The Anishinabe expanded their fur trade participation onto the plains, Daschuk illustrates, when the once-dominant Assiniboine were decimated by disease. The book merits a wide readership, though it seems so far to have flown under the radar. Daschuk has been earning some attention from the CBC’s The Current, the Globe and Mail , and best-of year-end lists, but nothing compared to the magnitude of the media furor earlier this year that greeted Ian Mosby’s revelations of malnourished First Nations people cruelly used in state-sponsored medical experiments. Such broad discussion of Clearing the Plains in the public arena has the potential to unsettle Canadians’ perception of the country’s historical relationship with First Nations, and to raise troubling questions about the persistent health disparity between Indigenous peoples and the broader population. A graduate of the University of New Brunswick (B.A.) and Trent University (M.A. ), Kevin Plummer is co-author of Historicist, an award-winning weekly column exploring Toronto history. Kudos for this very well-stated question. … And SHAME for such a repugnant, revolting, utterly pathetic, bunch of lies for an answer! Note the applause came after the question, and not from the dishonest reply. It seems to me that these youth ‘get it’. And I am happy to share this as it renews my faith in our upcoming generation who “won’t be fooled again”. Some history for those who are not aware of the sinister genocide to which is referred: “The Dominion, however, seemed only open to negotiations when settler development was imminent. Kudos also to Kevin Plummer for reporting this excellent news – something the rest of the bought-and-paid-for MSM chose to nearly totally ignore.